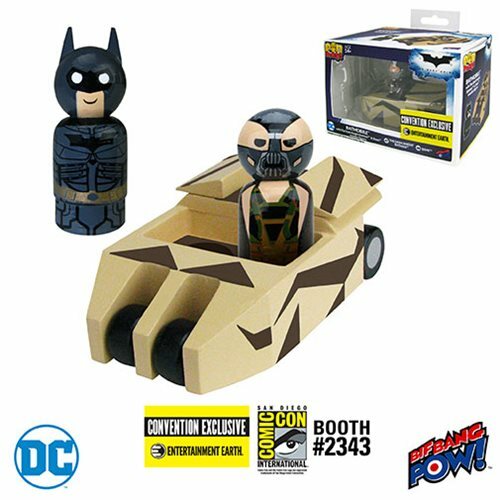 Retro-styled, 2-inch scale wooden vehicle with BATMAN™ and BANE™ figures! Inspired by the BATMOBILE™ seen in the 2012 film The Dark Knight… with exclusive camouflage detailing! Features rolling wheels and seats two Bif Bang Pow! Pin Mate™ figures. Highly detailed, brightly colored, 360-degree artwork. Each set is individually labeled with the production run number! Entertainment Earth Convention Exclusive! The BATMOBILE™ goes camo! Make way for this incredible Camouflage Batmobile with The Dark Knight Batman and Bane Pin Mate Wooden Figure Set - Convention Exclusive! Inspired by the BATMOBILE™ seen in the 2012 film The Dark Knight - with exclusive camouflage detailing - the retro-styled, 2-inch scale wooden vehicle sports rolling wheels and seats two Bif Bang Pow! Pin Mate™ figures. But wait! There's more! Included are retro-styled, 2-inch scale wooden Pin Mate™ figures of BATMAN (#47) and BANE (#48). The BATMOBILE™ and the figures feature highly detailed, brightly colored, 360-degree artwork, and each set is individually labeled with the production run number on a holographic sticker. Ages 14 and up.